: a life exemplified by abundance, happiness, purpose, health, and joy. MindBodyGreen founder Jason Wachob, in his first book, redefines successful living and offers readers instead a new life currency to build on, one that is steeped in physical and emotional health and wellbeing. 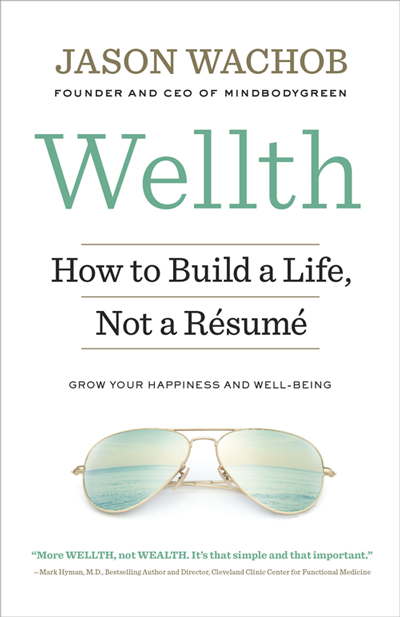 In this prescriptive memoir he shows us all how to build a life, not a resumé, and why it’s important to make frequent deposits into our own ‘wellth’ accounts. Don’t just take his word for it, read exclusive material from popular contributors and see what they have to say about becoming truly wellthy, including: psychologist Sue Johnson, Dr. Frank Lipman, Dr. Aviva Romm, Joe Cross, meditation expert Charlie Knoles, EWG director Heather White, and yoga phenom Kathryn Budig.